This article is about astronomical objects. For the Hollywood star system, see Star system (filmmaking). For a system of planets around a star or star system, see Planetary system. "multiple star" redirects here. For visual multiples, see double star. Top: The Algol three-star system imaged in the near-infrared by the CHARA interferometer with 0.5 mas resolution in 2009. The shape of Algol C is an artifact. Bottom-right: Artist's impression of the orbits of HD 188753, a triple star system. A star system of two stars is known as a binary star, binary star system or physical double star. If there are no tidal effects, no perturbation from other forces, and no transfer of mass from one star to the other, such a system is stable, and both stars will trace out an elliptic orbit around the barycenter of the system indefinitely. (See Two-body problem). Examples of binary systems are Sirius, Procyon and Cygnus X-1, the last of which probably consists of a star and a black hole. A multiple star system consists of three or more stars that appear from Earth to be close to one another in the sky. This may result from the stars actually being physically close and gravitationally bound to each other, in which case it is a physical multiple star, or this closeness may be merely apparent, in which case it is an optical multiple star (meaning that the stars may appear to be close to each other when viewed from planet Earth, as they both seem to occupy the same point in the sky, but in reality, one star may be much further away from Earth than the other, which is not readily apparent unless one can view them from a different angle). Physical multiple stars are also commonly called multiple stars or multiple star systems. 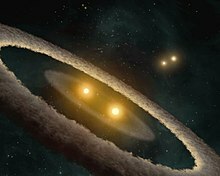 Most multiple star systems are triple stars. Systems with four or more components are less likely to occur. Multiple-star systems are called triple, trinary or ternary if they contain three stars; quadruple or quaternary if they contain four stars; quintuple or quintenary with five stars; sextuple or sextenary with six stars; septuple or septenary with seven stars. These systems are smaller than open star clusters, which have more complex dynamics and typically have from 100 to 1,000 stars. Most multiple star systems known are triple; for higher multiplicities, the number of known systems with a given multiplicity decreases exponentially with multiplicity. For example, in the 1999 revision of Tokovinin's catalog of physical multiple stars, 551 out of the 728 systems described are triple. However, because of selection effects, knowledge of these statistics is very incomplete. Multiple-star systems can be divided into two main dynamical classes: hierarchical systems which are stable and consist of nested orbits that don't interact much and so each level of the hierarchy can be treated as a Two-body problem, or the trapezia which have unstable strongly interacting orbits and are modelled as an n-body problem, exhibiting chaotic behavior. Star system named DI Cha. While only two stars are apparent, it is actually a quadruple system containing two sets of binary stars. Most multiple-star systems are organized in what is called a hierarchical system: the stars in the system can be divided into two smaller groups, each of which traverses a larger orbit around the system's center of mass. Each of these smaller groups must also be hierarchical, which means that they must be divided into smaller subgroups which themselves are hierarchical, and so on. Each level of the hierarchy can be treated as a two-body problem by considering close pairs as if they were a single star. In these systems there is little interaction between the orbits and the stars' motion will continue to approximate stable Keplerian orbits around the system's center of mass, unlike the unstable trapezia systems or the even more complex dynamics of the large number of stars in star clusters and galaxies. In a physical triple star system, each star orbits the center of mass of the system. Usually, two of the stars form a close binary system, and the third orbits this pair at a distance much larger than that of the binary orbit. This arrangement is called hierarchical. The reason for this is that if the inner and outer orbits are comparable in size, the system may become dynamically unstable, leading to a star being ejected from the system. Triple stars that are not all gravitationally bound might comprise a physical binary and an optical companion, such as Beta Cephei, or rarely, a purely optical triple star, such as Gamma Serpentis. simplex, quintuple system, hierarchy 4. Hierarchical multiple star systems with more than three stars can produce a number of more complicated arrangements, which can be illustrated by what Evans (1968) has called a mobile diagram. These are similar to ornamental mobiles hung from the ceiling. Some examples can be seen in the figure to the right. Each level of the diagram illustrates the decomposition of the system into two or more systems with smaller size. Evans calls a diagram multiplex if there is a node with more than two children, i.e. if the decomposition of some subsystem involves two or more orbits with comparable size. Because, as we have already seen for triple stars, this may be unstable, multiple stars are expected to be simplex, meaning that at each level there are exactly two children. Evans calls the number of levels in the diagram its hierarchy. A simplex diagram of hierarchy 1, as in (b), describes a binary system. A simplex diagram of hierarchy 2 may describe a triple system, as in (c), or a quadruple system, as in (d). A simplex diagram of hierarchy 3 may describe a system with anywhere from four to eight components. The mobile diagram in (e) shows an example of a quadruple system with hierarchy 3, consisting of a single distant component orbiting a close binary system, with one of the components of the close binary being an even closer binary. A real example of a system with hierarchy 3 is Castor, also known as Alpha Geminorum or α Gem. It consists of what appears to be a visual binary star which, upon closer inspection, can be seen to consist of two spectroscopic binary stars. By itself, this would be a quadruple hierarchy 2 system as in (d), but it is orbited by a fainter more distant component, which is also a close red dwarf binary. This forms a sextuple system of hierarchy 3. Higher hierarchies are also possible. Most of these higher hierarchies either are stable or suffer from internal perturbations. Others consider complex multiple stars will in time theoretically disintegrate into less complex multiple stars, like more common observed triples or quadruples are possible. Trapezia are usually very young, unstable systems. These are thought to form in stellar nurseries, and quickly fragment into stable multiple stars, which in the process may eject components as galactic high-velocity stars. They are named after the multiple star system known as the Trapezium Cluster in the heart of the Orion Nebula. Such systems are not rare, and commonly appear close to or within bright nebulae. These stars have no standard hierarchical arrangements, but compete for stable orbits. This relationship is called interplay. Such stars eventually settle down to a close binary with a distant companion, with the other star(s) previously in the system ejected into interstellar space at high velocities. Example of such events may explain the runaway stars that might have been ejected during a collision of two binary star groups or a multiple system. This event is credited with ejecting AE Aurigae, Mu Columbae and 53 Arietis at above 200 km·s−1 and has been traced to the Trapezium cluster in the Orion Nebula some two million years ago. The components of multiple stars can be specified by appending the suffixes A, B, C, etc., to the system's designation. Suffixes such as AB may be used to denote the pair consisting of A and B. The sequence of letters B, C, etc. may be assigned in order of separation from the component A. Components discovered close to an already known component may be assigned suffixes such as Aa, Ba, and so forth. A. A. Tokovinin's Multiple Star Catalogue uses a system in which each subsystem in a mobile diagram is encoded by a sequence of digits. In the mobile diagram (d) above, for example, the widest system would be given the number 1, while the subsystem containing its primary component would be numbered 11 and the subsystem containing its secondary component would be numbered 12. Subsystems which would appear below this in the mobile diagram will be given numbers with three, four, or more digits. 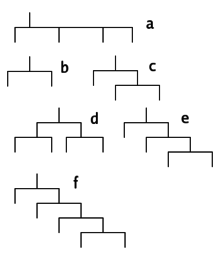 When describing a non-hierarchical system by this method, the same subsystem number will be used more than once; for example, a system with three visual components, A, B, and C, no two of which can be grouped into a subsystem, would have two subsystems numbered 1 denoting the two binaries AB and AC. In this case, if B and C were subsequently resolved into binaries, they would be given the subsystem numbers 12 and 13. WMC, the Washington Multiplicity Catalog, a hierarchical scheme in which the suffixes used in the Washington Double Star Catalog are extended with additional suffixed letters and numbers. For a designation system, identifying the hierarchy within the system has the advantage that it makes identifying subsystems and computing their properties easier. However, it causes problems when new components are discovered at a level above or intermediate to the existing hierarchy. In this case, part of the hierarchy will shift inwards. Components which are found to be nonexistent, or are later reassigned to a different subsystem, also cause problems. During the 24th General Assembly of the International Astronomical Union in 2000, the WMC scheme was endorsed and it was resolved by Commissions 5, 8, 26, 42, and 45 that it should be expanded into a usable uniform designation scheme. A sample of a catalog using the WMC scheme, covering half an hour of right ascension, was later prepared. The issue was discussed again at the 25th General Assembly in 2003, and it was again resolved by commissions 5, 8, 26, 42, and 45, as well as the Working Group on Interferometry, that the WMC scheme should be expanded and further developed. The sample WMC is hierarchically organized; the hierarchy used is based on observed orbital periods or separations. Since it contains many visual double stars, which may be optical rather than physical, this hierarchy may be only apparent. It uses upper-case letters (A, B, ...) for the first level of the hierarchy, lower-case letters (a, b, ...) for the second level, and numbers (1, 2, ...) for the third. Subsequent levels would use alternating lower-case letters and numbers, but no examples of this were found in the sample. Sirius A (center), with its white dwarf companion, Sirius B (lower left) taken by the Hubble Space Telescope. Alpha Centauri is a triple star composed of a main binary yellow dwarf pair (Alpha Centauri A and Alpha Centauri B), and an outlying red dwarf, Proxima Centauri. Both A and B form a physical binary star, designated as Alpha Centauri AB, α Cen AB, or RHD 1 AB, where the AB denotes this is a binary system. The moderately eccentric orbit of the binary can make the components be as close as 11 AU or as far away as 36 AU. Proxima Centauri, also (though less frequently) called Alpha Centauri C, is much further away (between 4300 and 13,000 AU) from α Cen AB, and orbits the central pair with a period of 547000(+66000/-40000) years. Polaris or Alpha Ursae Minoris (α UMi), the north star, is a triple star system in which the closer companion star is extremely close to the main star—so close that it was only known from its gravitational tug on Polaris A (α UMi A) until it was imaged by the Hubble Space Telescope in 2006. Gliese 667 is a triple star system with two K-type main sequence stars and a red dwarf. The potentially habitable "super-Earth" Gliese 667Cc orbits the red dwarf. HD 188753 is a triple star system located approximately 149 light-years away from Earth in the constellation Cygnus. The system is composed of HD 188753A, a yellow dwarf; HD 188753B, an orange dwarf; and HD 188753C, a red dwarf. B and C orbit each other every 156 days, and, as a group, orbit A every 25.7 years. Fomalhaut (α PsA, α Piscis Austrini) is a triple star system in the constellation Piscis Austrinus. It was discovered to be a triple system in 2013, when the K type flare star TW Piscis Austrini and the red dwarf LP 876-10 were all confirmed to share proper motion through space. The primary has a massive dust disk similar to that of the early Solar System, but much more massive. It also contains a gas giant, Fomalhaut b. That same year, the tertiary star, LP 876-10 was also confirmed to house a dust disk. HD 181068 is a unique triple system, consisting of a red giant and two main-sequence stars. The orbits of the stars are oriented in such a way that all three stars eclipse each other. HD 98800 is a quadruple star system located in the TW Hydrae association. Capella, a pair of giant stars orbited by a pair of red dwarfs, around 42 light years away from the Solar System. It has an apparent magnitude of around −0.47, making Capella one of the brightest stars in the night sky. Mizar is often said to have been the first binary star discovered when it was observed in 1650 by Giovanni Battista Riccioli, p. 1 but it was probably observed earlier, by Benedetto Castelli and Galileo. Later, spectroscopy of its components Mizar A and B revealed that they are both binary stars themselves. The Kepler-64 system has the planet PH1 (discovered in 2012 by the Planet Hunters group, a part of the Zooniverse) orbiting two of the four stars, making it to be the first known planet to be in a quadruple star system. KOI-2626 is the first quadruple star system with an Earth-sized planet. Xi Tauri (ξ Tau, ξ Tauri), located about 222 light years away, is a spectroscopic and eclipsing quadruple star consisting of three blue-white B-type main-sequence stars, along with an F-type star. Two of the stars are in a close orbit and revolve around each other once every 7.15 days. These in turn orbit the third star once every 145 days. The fourth star orbits the other three stars roughly every fifty years. If Alcor is considered part of the Mizar system, the system can be considered a sextuple. ^ p. 16, Understanding Variable Stars, John R. Percy, Cambridge: Cambridge University Press, 2007, ISBN 0-521-23253-8. ^ a b MSC—a catalogue of physical multiple stars, A. A. Tokovinin, Astronomy and Astrophysics Supplement Series 124 (1997), 75–84; online versions at VizieR Archived 11 March 2007 at the Wayback Machine and the Multiple Star Catalog. ^ Hipparcos: Double and Multiple Stars, web page, accessed 31 October 2007. ^ a b c MSC – a catalogue of physical multiple stars, A. A. Tokovinin, Astronomy and Astrophysics Supplement Series 124 (July 1997), pp. 75–84. ^ Binary and Multiple Stars, web page, accessed 26 May 2007. ^ p. 24, Galactic Dynamics, James Binney and Scott Tremaine, Princeton University Press, 1987, ISBN 0-691-08445-9. ^ Statistics of multiple stars: some clues to formation mechanisms, A. Tokovinin, in the proceedings of IAU Symposium 200, The Formation of Binary Stars, Potsdam, Germany, 10–15 April 2000. Bibcode 2001IAUS..200...84T. ^ Multiple Stellar Systems: Types and Stability, Peter J. T. Leonard, in Encyclopedia of Astronomy and Astrophysics, P. Murdin, ed., online edition at the Institute of Physics, orig. ed. published by Nature Publishing Group, 2001. ^ "Smoke ring for a halo". Retrieved 26 October 2015. ^ Heintz, W. D. (1978). Double Stars. D. Reidel Publishing Company, Dordrecht. p. 1. ISBN 90-277-0885-1. ^ Dynamics of multiple stars: observations Archived 19 September 2006 at the Wayback Machine, A. Tokovinin, in "Massive Stars in Interacting Binaries", 16–20 August 2004, Quebec (ASP Conf. Ser., in print). ^ Heintz, W. D. (1978). Double Stars. D. Reidel Publishing Company, Dordrecht. pp. 66–67. ISBN 90-277-0885-1. ^ a b Evans, David S. (1968). "Stars of Higher Multiplicity". Quarterly Journal of the Royal Astronomical Society. 9: 388–400. Bibcode:1968QJRAS...9..388E. ^ A Note on the Stability of Hierarchical Triple Stars with Initially Circular Orbits, L. G. Kiseleva, P. P. Eggleton, and J. P. Anosova, Monthly Notices of the Royal Astronomical Society 267, #1 (March 1994), pp. 161–166, Bibcode: 1994MNRAS.267..161K. ^ pp. 393–394, Evans, David S. (1968). "Stars of Higher Multiplicity". Quarterly Journal of the Royal Astronomical Society. 9: 388–400. Bibcode:1968QJRAS...9..388E. ^ Heintz, W. D. (1978). Double Stars. D. Reidel Publishing Company, Dordrecht. p. 72. ISBN 90-277-0885-1. ^ MSC – a catalogue of physical multiple stars, A. A. Tokovinin, 1997–1999, CDS ID J/A+AS/124/75. ^ Mazeh, Tzevi; et al. (2001). "Studies of multiple stellar systems – IV. The triple-lined spectroscopic system Gliese 644". Monthly Notices of the Royal Astronomical Society. 325: 343–357. arXiv:astro-ph/0102451. Bibcode:2001MNRAS.325..343M. doi:10.1046/j.1365-8711.2001.04419.x. ; see §7–8 for a discussion of the quintuple system. ^ Heintz, W. D. (1978). Double Stars. D. Reidel Publishing Company, Dordrecht. pp. 65–66. ISBN 90-277-0885-1. ^ Harrington, R.S. (1970). "Encounter Phenomena in Triple Stars". Astronomical Journal. 75: 114–118. Bibcode:1970AJ.....75.1140H. doi:10.1086/111067. ^ Fekel, Francis C (1987). "Multiple stars: Anathemas or friends?". Vistas in Astronomy. 30: 69–76. Bibcode:1987VA.....30...69F. doi:10.1016/0083-6656(87)90021-3. ^ Zhuchkov, R. Ya. ; Orlov, V. V.; Rubinov, A. V. (2006). "Multiple stars with low hierarchy: stable or unstable?". Publications of the Astronomical Observatory of Belgrade. 80: 155–160. Bibcode:2006POBeo..80..155Z. ^ Rubinov, A. V. (2004). "Dynamical Evolution of Multiple Stars: Influence of the Initial Parameters of the System". Astronomy Reports. 48: 155–160. Bibcode:2004ARep...48...45R. doi:10.1134/1.1641122. ^ Harrington, R. S. (1977). "Multiple Star Formation from N-Body System Decay". Rev. Mex. Astron. Astrofis. 3: 209. Bibcode:1977RMxAA...3..209H. ^ a b Heintz, W. D. (1978). Double Stars. D. Reidel Publishing Company, Dordrecht. pp. 67–68. ISBN 90-277-0885-1. ^ Runaway Stars, Trapezia, and Subtrapezia, Christine Allen, Arcadio Poveda, and Alejandro Hernández-Alcántara, Revista Mexicana de Astronomía y Astrofísica (Serie de Conferencias) 25 (2006), pp. 13–15, Bibcode: 2006RMxAC..25...13A. ^ a b Heintz, W. D. (1978). Double Stars. D. Reidel Publishing Company, Dordrecht. p. 68. ISBN 90-277-0885-1. ^ Blaauw, A.; Morgan, W.W. (1954). "The Space Motions of AE Aurigae and mu Columbae with Respect to the Orion Nebula". Astrophysical Journal. 119: 625. Bibcode:1954ApJ...119..625B. doi:10.1086/145866. ^ Hoogerwerf, R.; de Bruijne, J.H.J. ; de Zeeuw, P.T (2000). "The origin of runaway stars". Astrophysical Journal. 544 (2): 133–136. arXiv:astro-ph/0007436. Bibcode:2000ApJ...544L.133H. doi:10.1086/317315. ^ Heintz, W. D. (1978). Double Stars. Dordrecht: D. Reidel Publishing Company. p. 19. ISBN 90-277-0885-1. ^ a b Format, The Washington Double Star Catalog Archived 12 April 2008 at the Wayback Machine, Brian D. Mason, Gary L. Wycoff, and William I. Hartkopf, Astrometry Department, United States Naval Observatory. Accessed on line 20 August 2008. ^ A. A. Tokovinin (July 1997). "MSC – a catalogue of physical multiple stars". Astronomy and Astrophysics Supplement Series. 124, section 2.4: 75–84. Bibcode:1997A&AS..124...75T. doi:10.1051/aas:1997181. ^ a b c d William I. Hartkopf & Brian D. Mason. "Addressing confusion in double star nomenclature: The Washington Multiplicity Catalog". United States Naval Observatory. Retrieved 12 September 2008. ^ "Urban/Corbin Designation Method". United States Naval Observatory. Retrieved 12 September 2008. ^ "Sequential Designation Method". United States Naval Observatory. Retrieved 12 September 2008. ^ A. Tokovinin (18 April 2000). "On the designation of multiple stars". Retrieved 12 September 2008. ^ A. Tokovinin (17 April 2000). "Examples of multiple stellar systems discovery history to test new designation schemes". Retrieved 12 September 2008. ^ William I. Hartkopf & Brian D. Mason. "Sample Washington Multiplicity Catalog". United States Naval Observatory. Retrieved 12 September 2008. ^ A new classification scheme for double and multiple stars, R. W. Argyle, The Observatory 124 (April 2004), pp. 94–96, Bibcode: 2004Obs...124...94A. ^ Mason, Brian D.; Wycoff, Gary L.; Hartkopf, William I.; Douglass, Geoffrey G.; Worley, Charles E. (December 2001). "The 2001 US Naval Observatory Double Star CD-ROM. I. The Washington Double Star Catalog". The Astronomical Journal. U. S. Naval Observatory, Washington D.C. 122 (6): 3466–3471. Bibcode:2001AJ....122.3466M. doi:10.1086/323920. ^ 4 Centauri Archived 15 June 2011 at the Wayback Machine, entry in the Multiple Star Catalog. ^ The Binary Stars, R. G. Aitken, New York: Semi-Centennial Publications of the University of California, 1918. ^ A New View of Mizar, Leos Ondra, accessed on line 26 May 2007. ^ Nemravová, J. A.; et al. (2013). "An Unusual Quadruple System ξ Tauri". Central European Astrophysical Bulletin. 37 (1): 207–216. Bibcode:2013CEAB...37..207N. ^ Gregg, T. A.; Prsa, A.; Welsh, W. F.; Orosz, J. A.; Fetherolf, T. (2013). "A Syzygy of KIC 4150611". American Astronomical Society. Bibcode:2013AAS...22114212G. ^ Lohr, M. E.; et al. (2015). "The doubly eclipsing quintuple low-mass star system 1SWASP J093010.78+533859.5". Astronomy & Astrophysics. 578. arXiv:1504.07065. Bibcode:2015A&A...578A.103L. doi:10.1051/0004-6361/201525973. ^ Castor A and Castor B resolved in a simultaneous Chandra and XMM-Newton observation, B. Stelzer and V. Burwitz, Astronomy and Astrophysics 402 (May 2003), pp. 719–728. ^ ADS 9731: A new sextuple system, A. A. Tokovinin, N. I. Shatskii, and A. K. Magnitskii, Astronomy Letters, 24, No. 6 (November 1998), pp. 795–801. ^ Nu Scorpii Archived 5 September 2017 at the Wayback Machine, entry in the Multiple Star Catalog. Wikimedia Commons has media related to Multiple star systems.